A printable tribal baby shower diaper raffle ticket/card in teal, purple and gray. Ticket measures 3.5x2 inches. You will receive an 8.5x11 digital sheet containing 8 tickets. Text reads: Bring a pack of diapers (any size) for a chance to win a prize! This is a digital file only. No physical product will be shipped to you. This is not an editable file. Customization is not included with this listing. 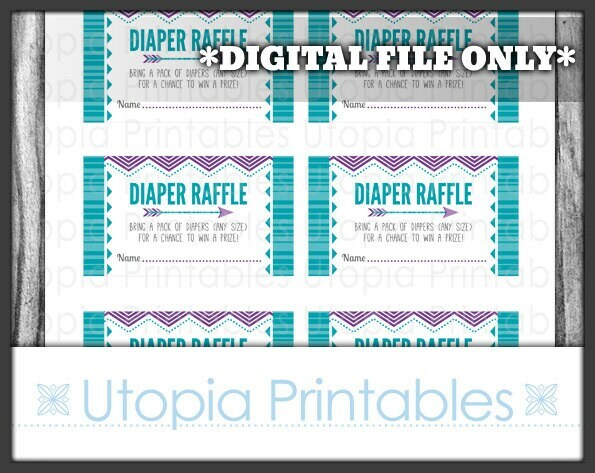 The "Utopia Printables" watermark does not appear on the actual file. File dimensions: 300dpi; JPEG format; one 8.5x11in page.